Start your visit to Rich Mountain Battlefield, Historic Beverly, or the Staunton-Parkersburg Turnpike Byway at the Beverly Heritage Center. 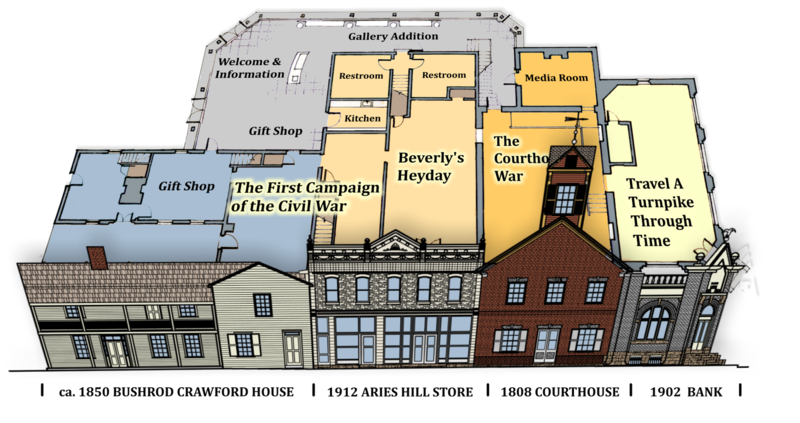 The Beverly Heritage Center combines four adjoining buildings in the heart of Beverly into one great heritage attraction. The Beverly Heritage Center combines four very different historic buildings with a functional 21st century gallery. Some of the story behind the creation of the BHC. Enjoy our introductory film and four distinct exhibits showcasing the Turnpike, Courthouse War, Beverly’s Heyday, and the First Campaign of the Civil War. Tour groups please talk with us about the special experiences we can provide for your group. Guided tours, living history, and demonstrations can be arranged for your special experience. Call 304-637-7424 or email info@beverlyheritagecenter.org to get set up! The new gallery and the courthouse offer medium-sized public spaces for your meeting or event. Modern kitchen and sanitary facilities are available on site. Call 304-637-7424 or email info@beverlyheritagecenter.org to find out more. The Beverly Heritage Center is a non-governmental non-profit organization that depends on individual and private supporters to continue. Find out how you can help. BHC is a joint operation of three organizations, each with a distinct mission. We invite you to learn more and get involved. The Rich Mountain Battlefield Foundation is working to preserve the Rich Mountain Battlefield and Camp Garnett, so that all of our citizens, now and in the future, will be able to appreciate this vital part of our heritage. Historic Beverly Preservation is the non-profit organization dedicated to the restoration, heritage and preservation of historic Beverly. The Staunton - Parkersburg Turnpike Alliance was originally formed in the fall of 1994 to further preservation and promotion of related historic sites in the area. The Beverly Heritage Center lies on the Turnpike route and houses the Alliance and its museum display. Many allied organizations have played an important role in the developments that led to the Beverly Heritage Center, while others have related programs and goals.